gecombineerd met de challenge van Bizzy Becs Creatalicious challenges. Bij Creatalicious challenges moest je werken met pink (roze) of Plum (pruimenkleur) groen en burgundy (weet niet wat voor kleur dat is). Vind hem zelf wel erg leuk geworden. 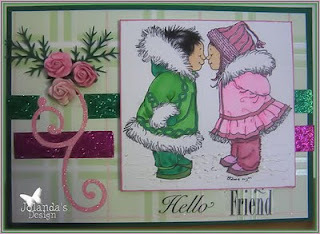 This card was made by a sketch from Jessica Lynn Original challenge and wit a challenge from Bizzy Becs Creatalicious challenges. By Creatalicious challenges you have to work with the colours Pink or Plum green and Burgundy (the last 1 I don't know what colour that is). But I like the card I made. Wat een geweldig gaaf stempeltje! Je kaartje is heel erg mooi. Leuk die glitters. This is so beautiful! I love your take on Jessica's sketch! Gorgeous,so beautifully coloured and such pretty detail!! !